After the success of our first workshop, which you can read about here, on Sunday 21 August we had a day of history of electricity themed fun at Harewood House, as part of which we unveiled our new history of lighting displays. With one Below Stairs and one on the State Floor, these new displays and their accompanying interpretation were based on the results of our research in the Harewood archives and in the West Yorkshire Archives. The Below Stairs lighting cabinet now tells the story of how electricity came to Harewood House – including how the original electrical installation was powered by a hydroelectric turbine. In addition it exhibits the only physical evidence we have found of the gas lighting which would have been used below stairs between the 1860s and the installation of electricity: two gas burners. Also featured is a copy of the original electric lighting specification for the house, from 1901, which shows how comprehensive the system was: even the servants’ bedrooms and toilets were to have electric lights. However, candlesticks and oil lamps dating from the 1930s and 40s also demonstrate that older technologies were still used to supplement electricity, either as back-ups in case of power-cuts, or perhaps because the softer, gentler light of the flickering flames was sometimes preferred. The Below Stairs Lighting Cabinet at Harewood House, featuring candlesticks, oil lamps and electrical fittings. The plans for Princess Mary’s Dressing Room, including lighting, displayed on the State Floor at Harewood. We began our day of activities with a short talk given by Collections Assistant Rebecca Burton about the research we had done, inviting people to see the new displays and also to attend our workshop scheduled for the afternoon. Using documents from the archives Rebecca went through the story of Harewood’s electrification, from the first electric lights in 1901 to the installation of appliances like television – and an ice cream cabinet! – in the 1950s. Talking about the history of electricity in the house. Visitors also had the chance to engage in electricity-themed arts and crafts: making and decorating cup and string telephones – an activity popular with adults as well as with children! We believe that telephones were probably installed in the house before electric lights, and telephones featured in our workshop as during the 1930s, when the workshop performance was set, the family installed an automatic internal telephone system in the house. It was also at this time, in 1933, that the local telephone exchange switched from manual to automatic, prompting the Post Office to send a representative to the house to explain how to use the new system. The electricity-themed arts and crafts activity – making and decorating cup and string telephones – was popular with children and adults alike! Before the workshop, our three actors walked around the house in costume interacting with visitors in character: Mrs Merton, the housekeeper, was showing Mr Symes, the electrician, around to look at the electrical systems, and Betty the maid was trying to stay out of their way! This provided a fun way to draw attention to the workshop and introduce the characters. Mrs Merton the housekeeper shows the electrician Mr Symes around the house. The workshop itself followed the same structure as the one we ran for IntoUniversity students a few weeks earlier, which you can read more about here, beginning with a performance – in the authentic environment of the Steward’s Room – about the modernisation of the house in the 1930s by the 6th Earl and Princess Mary, and followed by an opportunity for the audience to ask questions of the characters. Mr Symes talks to Betty about her job – and her nervousness about electricity – in the authentic surroundings of the Steward’s Room. Mrs Merton answers a question from the audience. As before, we then introduced the children to old electrical objects from Artemis, the Leeds Museums and Galleries object loan service, which were again very popular, with kids noting how heavy things like the 1930s vacuum cleaner and the kettle were compared with their modern equivalents, and also how different old plugs looked compared with the ones we’re familiar with today. Kids investigating the objects from Artemis: the vacuum cleaner was heavy! As well as these activities the children also had the opportunity to do an electricity trail, which encouraged them to seek out various electrical and other lighting-related artefacts placed around the Below Stairs area of the house. We were very pleased with how our various activities were received; we had a full house for the workshop, and the crafts activity was consistently well attended. In focusing on electricity for a day we’ve certainly provided something new for visitors, and successfully launched our newly researched interpretative materials. Our final workshop for this project will be held at the University on Sunday 11 September as part of Heritage Open Days. We’ve had a very busy couple of weeks delivering two of our workshops and finishing off our new displays at Harewood as part of our collaborative project. The first workshop, on Thursday 11 August, was for students from IntoUniversity, a national charity which provides local learning centres where young people are inspired to achieve. In particular they work with children from disadvantaged postcode districts who are statistically less likely to go to university or enter the professions than those in more advantaged areas, providing academic support, mentoring, and informal educational opportunities. In our case the workshop we ran fitted in nicely to a programme of activities the local Leeds centres were running over the summer holidays. Earlier that week the students had taken part in two other drama-based workshops, so they were familiar with performing with one another, and had also been learning about artificial intelligence and the way AI technologies might change our lives in the future. We thus framed our activities looking at the history of electricity as a way to see how people responded in the past to what was then a brand new technology which was beginning to become widespread in people’s homes, and looking at how people responded differently to this. The workshop was split into three sections, beginning with a short piece of drama from our three performers based on new research in the archives at Harewood House and in the West Yorkshire Archives. Set in the 1930s, a time when many electrical systems in the house were being modernised and extended, the performance introduced the audience to members of staff at Harewood and to a visiting electrical engineer who was looking at the electrical systems, in particular the electrical call bells which needed to be improved. Betty the maid is sent to fetch some tea for Mrs Merton and Mr Symes. As well as interacting with one another, over the course of the performance each character talked to the audience about how they felt about electricity. Mrs Merton the housekeeper remembered when the electricity was originally installed in the house back in 1901 (powered by a hydroelectric turbine), and had seen a lot of things change and improve over time – whilst acknowledging that new electrical conveniences don’t often work very reliably at first! Betty the maid was nervous of electricity. Her mother was a maid many years ago, when electricity was newer and more experimental, and she passed her anxiety about electrical accidents on to her daughter, even though things were safer by the 1930s. Finally Mr Symes the electrician – a character taken straight from the archival sources – was disappointed at how electrical engineers such as himself were still struggling as a profession to build a reputation, and needed to prove they knew best. Mr Symes talks to the audience. The background picture is the Steward’s Room at Harewood House, where the performance was set. After the performance, the students had the opportunity to ask the characters questions – which they took advantage of in ways we didn’t necessarily expect! We had some great engagement, with questions ranging from ‘how do you make electricity from water?’ and ‘who discovered electricity?’ to ‘is that a wig’ (to poor old Mrs Merton!) and ‘why do you do history?’ – a question which I was very happy to answer myself. Next we moved on to some museum object handling. Using artefacts from the collections of the University’s Museum of the History of Science, Technology and Medicine, I talked about the history of electricity supply and use in the home. These artefacts included two examples of early batteries – one wet cell one dry cell – with which I pointed out for example that country houses such as Harewood needed to supply their own electricity for a long time before they were connected to centralised power stations, and their electrical installations always included lots of large wet cell batteries. We also touched on the importance of measuring how much electricity you were using, and, in contrast to Betty the maid’s fear of being hurt by electricity, how some people used mild electrical currents as a form of therapy. This last point I illustrated using a particularly interesting object from our collection: an electrical therapy machine designed for use at home, with two electrodes which the user would apply to parts of their body in order to administer a gentle electrical current. This, it was argued, was efficacious against many ills, such as headaches, nervous disorders, and even deafness and baldness. We believe ours dates from the late nineteenth-century, but devices such as these were certainly in use up until the 1920s and 30s. Showing the students the electrical therapy machine. Whilst presenting these artefacts, I talked to students about best practice in museum object handling: the importance of gloves, of using both hands to pick things up and holding them over tables. Next we gave the students the chance to handle some historic objects themselves. Although our own collections were too fragile to allow this, we hired out handling objects from Artemis, the object loans service run by Leeds Museums and Galleries. These domestic electrical appliances from the 19230s, 40s and 50s included hairdryers, a kettle, a wireless set, an iron, a toaster, a vacuum cleaner and a radiator, and students were very keen to put their gloves on and investigate. As a hands-on activity this was very popular; the children were happy to have the opportunity to explore these objects themselves. Knowing they were free to pick them up on their own was invaluable and a great experience. Gloves on! The students get to handle some electrical objects from Artemis. The third and final section of the workshop linked our historical materials to the work the students had done with drama and artificial intelligence. We encouraged them, with the help of our actors, to devise their own short performances about how they thought artificial intelligence might change the way we live in the future. The initial performance was thus a template for them to apply to a new technology: back in the 1930s electricity was beginning to change the way people lived at home through the increasing availability and growing affordability of new electrical appliances. In the future, we asked them, how will people respond if we start using intelligent machines in the domestic sphere? The results were excellent – in small groups the students came up with stories such as: teaching robots how to dance, and thus understanding that they could be fun companions; patients’ concerns about being treated by a robot doctor instead of a human after an accident; a robot teacher who wanted to take over from its human counterpart because it believed itself better suited to the task; and a robot dog which learned by itself how to speak to its unsuspecting owner, but subsequently began to exhibit increasingly subversive behaviour as its intelligence learned and grew, prompting the cliff-hanger question: was it good or evil? The energy levels in the room were fantastic throughout; the students certainly seemed to have a lot of fun, and we really enjoyed having them! Over the past few weeks of our collaborative project with Harewood House I have been working both in Harewood’s archives with Collections Assistant Rebecca Burton, and with our three actors to devise and rehearse a script for our performance. In terms of research, we have been able to answer several questions about the history of Harewood’s electrification, such as being able to confirm that the initial installation used hydroelectric power generated by a turbine, with an oil engine back-up, and that the House definitely did have gas lighting below stairs before the installation of electricity, but this was then removed – this had been a subject of some speculation. This will feed into our new displays and interpretation, and also into the performance. We have also been selecting new objects and writing the new interpretation for the lighting cabinet, with aim of launching this on the day of the Harewood workshop, Sunday 11 August. 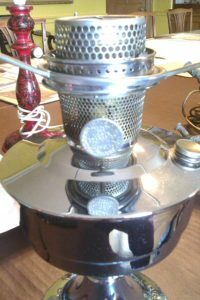 This kerosene lamp was purchased around 1930, indicating that even after electrification alternative sources of lighting were still useful. This workshop will act as the focal point of a day in which we showcase our research in a number of ways. Firstly, Rebecca will give a short collections ‘discovery‘ talk about project to visitors, and point out that we have put together two new displays on the history of electricity at Harewood: one below stairs as an exhibit about the different lighting technologies used in the House over the centuries, and the other on the State Floor in Princess Mary’s Dressing Room, which was electrified as it was built according to her specifications. Prior to the workshop itself at 2pm, the actors will also move around the house and grounds in costume, interacting with visitors and drawing attention to the workshop. Finally, a craft activity making cup-and-string telephones will go on in the House all day. 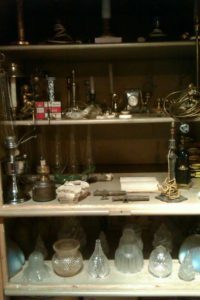 Putting together the new display in the lighting cabinet below stairs at Harewood: candlesticks, oil lamps, gas burners, electric light switches and electrified candlesticks. As far as the workshop itself is concerned, we have decided to set the performance, which is about 10 minutes long, in the 1930s, when the 6th Earl and Princess Mary modernised the house further, rather than the original period of its electrification, 1901. Instead, one of the characters, the housekeeper at Harewood, will be old enough to remember the original installation and discuss it in a soliloquy to the audience. The other two characters, Betty, a young maid nervous about electricity because her mother, who was also a maid 30 years ago, warned her about it, and Mr Symes, an electrical engineer visiting Harewood to survey the alterations being undertaken and offer advice, will also talk to the audience about their lives and points of view as well as conversing with the other characters. The housekeeper Mrs Merton and Betty the maid in rehearsals. Whilst the housekeeper’s and the maid’s costumes came from the costume store run by the School of Performance and Cultural Industries at the University – including an excellent white wig – we hired the electrical engineer’s costume from the West Yorkshire Playhouse, which entailed a visit to their costume department to sort through their large collection of period clothing. The results, as depicted, were brilliant. Mr Symes, the 1930s electrical engineer. After the performance, I will run an object handling session for participants, demonstrating some basic guidelines for examining museum artefacts. We will use objects from the University‘s Museum of the History of Science, Technology and Medicine, but these are not appropriate for handling sessions due to their rarity and fragility, so I will present and discuss these objects to talk about the early history of electricity supply – in particular how early installations at country houses needed to be self-contained, and how important it was to be able to measure how much electricity was being used. After this, we will give workshop participants the opportunity to handle for themselves some old 1920s-40s domestic electrical appliances borrowed from Artemis, an object loan service run by Leeds City Council. Artemis has an extensive handling collection which it provides for schools and museums, and these objects can be used to enhance lessons or workshop sessions such as ours. To find out how our workshops go you can of course follow us on Twitter (@EtCHproject), and now we’re on Instagram as well: follow us, ‘electricalheritage‘! The cast: Joel Briscoe as Mr Symes, Mattie Davies as Mrs Merton and Megan Rutter as Betty. Our panel at ESSHC 2016, Valencia. Last month I spent some time travelling and giving talks about our project, and was very encouraged by the positive feedback we received. It began with a talk at the end of March in Valencia at the European Social Science History Conference, given as part of a panel on energy use in the countryside. As a historian of science and technology I must admit that this was not a conference which would otherwise have appeared on my radar, being very general in scope, but it was for precisely this reason that it afforded Abigail Harrison-Moore and me the opportunity to reach out and engage a broader cross-section of the wider historical community with our project. At a conference of that size you don’t expect large audiences for any one session, but we were very pleased with the level of engagement with our topic, and the thoughtful comments and discussion which followed the panel. Although there were only a handful of historians of technology at the conference, the attendance at our session and the conversations which have come out of our meetings with other scholars have demonstrated to us the unexpectedly large degree to which other people are working on questions related to ours within their own respective historical disciplines. Although as historians I feel we tend to fracture quite easily into insular sub-groups – historians of STEM, economic historians, art historians, environmental historians… – I would certainly recommend attendance at broader conferences such as the ESSHC as a means of reaching out beyond our own disciplinary communities. Professor Graeme Gooday explains how electric arc lighting first came to London. I then delivered our Cragside, Standen and Lotherton Hall public lectures. The first of these, focusing on Cragside, was given jointly with Graeme Gooday at the Newcastle Literary and Philosophical Society, the very venue were Swan first presented his lightbulb in February 1879 – noted by one attendee in their feedback: “It was great to have this here where Swan first demonstrated.” The turn-out was excellent – nearly 70 people – and our double-act was very effective: we shared out the material such that Professor Gooday covered the more general sweep of the narrative, and I focused in on developments at Cragside where they were key to the story. This switching between speakers ensured we maintained a good pace, as well as the interest of the audience! My talk in the Drawing Room at Lotherton Hall. For each talk, we asked attendees to tell us the most interesting thing they had learnt. One of the most common responses to this question was the role of women in the story of the uptake of domestic electricity. Some respondents noted the importance of women in promoting the acceptance of the new technology as something of which they had been unaware; for others it was the concerns of women regarding the brightness of electric lighting compared to softer gas, oil or candle lighting which was most interesting. My next and final such public lecture of the project will be at Nostell Priory, a National Trust property near Wakefield, close to Leeds, on Sunday 19 June; please check the events page for more details. Presenting the project: a workshop and a short film – Lotherton Electrified! Our project workshop on 1 February brought together country house staff from around the UK, representing the National Trust, English Heritage and various local councils and privately owned properties. We demonstrated some of our outputs, including our Light Night performance, this time starring a couple of the students from the Electrified musical. This came as something of a surprise to the participants as we hadn’t told them in advance that they were going to be watching a piece of live theatre! Shooting our short film at Lotherton Hall. 1. Thinking about what you‘ve seen today what are the potential applications of our outputs and/or research in your institution? 2. What would have to happen for you to benefit from these outputs? The resulting discussion, in small groups, highlighted that looking at the role of women in the story of electrification – emphasised throughout Gooday and Harrison-Moore‘s work – provided a very good way to tell these stories to interested audiences. Also useful was the way in which we demonstrated how country houses could work more closely with universities local to them to generate new knowledge, resources or events: for example by history students undertaking primary research as part of an undergraduate or masters course in order to gain research skills and experience; or by drama students producing performances based on materials related to the house, as we have done for Light Night, ‘Electrified‘, our online interactive, and our short film. However, it was also generally noted that staff and volunteers in many houses may be reluctant or not confident enough to present science or echnology content to visitors. In such cases training sessions would be invaluable, and could emphasise how these topics fit into the stories that are already told in these properties. It was also suggested that we might beneficially create a network to facilitate knowledge exchange between technology and history experts on the one hand and interpreters and country house staff on the other. This could provide help interpreting science and technology content for educational, curatorial or exhibition interpreters to use, as it was noted that it‘s often difficult to communicate the significance of electrical technologies, including objects and systems, to visitors. Finally, our short film, Lotherton Electrified, is now available to view online (see below). In it, a reporter visits Lotherton Hall in 1904 to interview the family and servants about the new electrical lighting in the house, but is also concerned about an accident which recently occurred on the property. This is, it must be noted, entirely fictional, but the fears and concerns of the period regarding electricity which it illustrates were very real, and electrical accidents, although not normally fatal, were not uncommon. The cast of Lotherton Electrified. The preparation of the individual rooms for filming required a lot of thought, and a lot of support and help from Lotherton staff Dionne Matthews and Adam Toole; we tried to avoid including too much anachronistic technology or interpretation boards in the background! The music, too, is appropriate: it is from the 1879 song ‘The New Electric Light‘, which was also used in the Electrified musical, and was recorded by another member of the cast, Mathilde Davies. The students handled the pressure and intensity of the afternoon very well, and the result is a short, 10 minute film pitched at a general, non-specialist audience, which Lotherton can show on tablets around the house or in its cinema room as appropriate. On Monday 1 February we will be holding our project workshop at the University, in the Brotherton Room of the Brotherton Library. This is the same venue where we held our Light Night performance in October. Please see below for the full text of the invitation. The ‘Electrifying the country house’ project, run by Professor Graeme Gooday and Dr. Abigail Harrison-Moore at the University of Leeds, is holding a workshop on Monday 1 February 2016 at the University to present our work so far and to discuss how we can further develop and build on this existing work. Over the course of this one year AHRC-funded project, we have been developing educational visitor resources for country houses based around their electrical heritage technologies, such as lighting and telephony. Our three partner houses are Cragside, Rothbury and Standen, East Grinstead (National Trust), and Lotherton Hall, Leeds (Leeds City Council). At this workshop our discussions will include considering potential future funding avenues for the project and the involvement of new partner houses. We will present and demonstrate the outputs we have produced for our partner houses, including: electrical heritage house trails; explanatory animations about electrical artefacts and systems; an online digital interactive resource for KS2 pupils; and a short drama performance about the different responses people had towards the use of electricity in the home. We would like to invite representatives from country houses around the UK who might be interested in our work to join us at the University. The workshop will take place in the Brotherton Library, from 12-5pm, and will be followed by a drinks reception from 5-6pm. We have funding available to cover transport costs, and lunch will be provided. However, places are limited, so please register your interest soon in order to avoid disappointment. To book a place, please email the project researcher, Michael Kay, at M.A.Kay@leeds.ac.uk, by 1 January. To learn more about our project please read our blog, www.electrifyingthecountryhouse.org, or follow us on Twitter, @EtCHProject (Electrical Heritage). Work on our history of electricity musical has now begun in earnest, and the final year theatre and performance students in the School of Performance and Cultural Industries (PCI) are putting a lot of time into writing the script and song lyrics, composing the music and choreographing the dance scenes, as well as designing a period-appropriate set. There are 24 students in all and they supervised by Dr. George Rodosthenous (Associate Professor in Theatre Directing) and Dr. Tony Gardner (Lecturer in Performance Processes & Techniques). Having given them material to read over the summer I went to see them at the beginning of their project a couple of weeks ago to talk to them about our work and how they might think about adapting it for the stage, especially given my recent experience working with other drama students to produce our Light Night performance. They have a blog, which you can visit for news, photos and podcasts about the development of the production. They’re also on Twitter: @ElectrifiedPCI. Light Night: the lady of the house‘s costume. 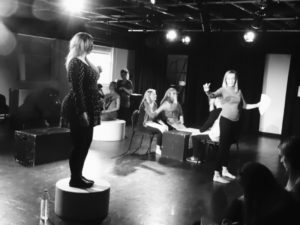 Although working with drama students wasn’t something we originally envisioned being a large part of this project, our collaborations in this area have nevertheless produced some of our most innovative and creative outputs. We have developed a very good working relationship with our colleagues in the School of PCI, George Rodosthenous and Tony Gardner, and have found the students very enthusiastic to take part in other opportunities to dramatise our project materials. As a result, our dramatic outputs have now expanded to include – as well as the musical – our Light Night performance, guide characters for our KS2 history of electricity digital interactive, and a short film we will shoot at Lotherton Hall in December. The students have also taken it upon themselves to organise an educational workshop at the University for local school children at which they will perform sections of the musical. Our digital interactive is currently being built by our technical officer, Corey Benson. It will benefit from the involvement of the students through the use of green screen filming techniques to insert them into video footage of the houses in order to explain elements of the history of electricity. The interactive itself will comprise floor plans of each of the three partner houses, which pupils will navigate around in the order in which they were electrified (Cragside, Standen, Lotherton Hall). For each house there will be four clickable rooms on the floor plan which pupils can select to learn more about the history of electricity in that particular room. Each house will have a guide character, played by one of the students. These characters will introduce themselves and their respective houses to pupils at the beginning of the interactive, and will then talk to them about specific areas of the history of electricity (science and technology, aesthetics, social history) in videos in each room. The last dramatic output (for now) is our Lotherton Hall short film. This will be about ten minutes long and will explore what happens when a reporter from a London ladies‘ journal visits the house in the early 1900s to talk to the family and the servants about their new electrical installation. She is concerned in particular with the potential for accidents, especially given the number of people who have been injured or killed by domestic electricity around the country over the preceding few years. I am currently working with a small group of the Electrified students to develop this, and we will film it in Lotherton Hall in December alongside the footage for the digital interactive and the green screen guide characters. The film will be on display at Lotherton Hall for visitors to watch in spring 2016. The maid from our Light Night production: scared of electricity. I think these enthusiastic collaborations with staff and students from the School of PCI are due in part to the appeal of the stories and anecdotes Graeme brings out in his book Domesticating Electricity, the source material for the project. These humanising stories of the fears and hopes of the people of the time, and the sometimes amusing, sometimes tragic, accidents or problems they ran into, serve to bring the period to life, and lend themselves well to dramatisation. As we consider the ways in which we might further develop this project in the future, the success and excitement of these dramatic outputs is something which we are very much keeping in mind. Performances of Electrified will be on Thursday, Friday and Saturday the 10th, 11th and 12th of December at 7:30pm, Stage One, Stage@Leeds. Tickets are now on sale here. Light Night 2015: It’s Electrifying! The Housekeeper – in two minds about electric light. On Friday evening, 9 October, we put on a special performance in the Brotherton Library’s Brotherton Room with the help of four student actors from the School of Performance and Cultural Industries (PCI). Called ‘It’s Electrifying!’, the show was organised as part of Leeds Light Night, an annual evening of free arts events (exhibitions, performances, installations) all based around the theme of light that takes place across the city, including the University. As this ties in so well with the themes of our project, this was too good an opportunity to pass up. Working closely with a colleague from the School of PCI, George Rodosthenous, who is also one of the lecturers supervising the production of our Electrified musical, we recruited four drama students as volunteers to take part in our show. Fitting in planning, script writing, rehearsals and organising costumes around everyone’s busy schedules was a challenge, but the students worked hard, and other members of PCI staff were also very helpful; special thanks go to Allana Marsh and Steve Ansell for helping to sort us out with costumes and props at quite short notice! We started with the maid cleaning outside the room and humming, before noticing the audience and inviting them in. We used the performance to address the hopes and fears surrounding the introduction of electric lighting into people’s homes around the end of the nineteenth century. There were four characters, representing a range of classes and opinions, for example the young lady of the house, excited at the aesthetic possibilities of the electric light, and her mother-in-law, who was sceptical, didn’t understand what electricity was or how it worked, and didn’t think it should be brought into their home. The older lady – didn’t understand electricity. We also had the housekeeper, who was happy that the new lights didn’t give off any soot or smoke to blacken the paintwork, but who was sad to need to make redundant the boy who had been in charge of the candles and oil lamps. Finally, the maid was wary, knowing that people had died through accidents involving electricity. The 15 minute show ran four times over the course of the evening, and over 110 people came to see it. We even had a song about the electric light from the 1880s, which the characters sang and hummed over the course of the performance. The Brotherton Room itself was also the perfect venue for the show; dating back to the 1930s with the rest of the main body of the Brotherton Library, it is an incredibly atmospheric space, and made a very passable country house library for the performance. It looked great lit up with electric candles. One half of our display of objects…. Also forming part of the event was a display of historic electrical objects from the University’s Museum of the History of Science, Technology and Medicine, which we used to tell the story of domestic electricity from its generation to its use in the home, from the 1880s until the 1940s. These included an old battery, a copy of a Mrs. Beeton book from the 1920s which dealt with electric cookery, and an Overbeck Rejuvenator, a 1920s electrical therapy kit for use by individuals in their own homes. The audience was encouraged to take a look at this display after the performance. We got great feedback on the creativity, the costumes, and of course the singing! We’d like to thank our colleagues in PCI, in the Brotherton Library and in the Museum, and in particular the PCI students, for all their help making this event possible. In the wake of the very enjoyable ‘Old Science Week’ at Lotherton Hall last week, I’ve been thinking about how it went. I was there for the Monday and the Wednesday, which you can read about here and here respectively. The ice cream maker, hair dryer, toaster, plugs, electricity meter, telephone and vacuum cleaner. Working with Lotherton Hall on this event meant that we were able to use the usual setting for family activities at the house. This is the Servants’ Hall, a great adaptable space which can accommodate large groups of adults and children, and allow for all sorts of interaction, engagement and creativity. The week fitted into Lotherton Hall’s “Six Weeks of Summer” programme, a series of themed weeks aimed at school aged children during the summer holidays. As such, a handling table and arts and crafts related to the theme and collections were on offer. Some of the objects on display for handling, old electrical domestic appliances, as pictured here, were borrowed from Artemis, Leeds City Council’s artefacts loan service. Although Lotherton’s themed weeks are largely for younger children, we knew our engagement would be with visitors of all ages, some as part of a family and some alone or with friends. Thus the best format for the activities – in line with other crafts activities held in this space – was a series of drop in sessions which people could join and leave as they wished. This wouldn’t tie them into being there at any particular time or require them to participate in anything too structured or formalised. As Dee Matthews, Lotherton’s Learning Officer, later observed, the end of the summer holidays begins to quieten down; it was thus easier to engage with visitors for longer periods, and to encourage them to think about what each object was and how it was used. Relating this to electrical appliances and gadgets in their own homes was also very effective. One of the decisions we needed to make when thinking about how best to run these activities was whether or not to include any written interpretation. We considered for example a fact sheet about the history of electricity, or domestic lighting at Lotherton, but Dee recommended that it wouldn’t be appropriate for the setting. It also might look as though we were trying to create too formal a learning environment, but with various craft activities and object handling there was plenty on offer to keep the visitors interested. The sign next to the objects. Instead we decided that it would be best simply for me to talk to those adults who were interested to find out more about the topic and about the work of the project. This I did on a couple of occasions. We also included a sign next to the handling objects which explained why they were there, invited people to pick them up, and asked a couple of simple questions aimed at the children. However, in hindsight, I think there may have been an advantage to having a simple interpretation sheet near the objects for the benefit of adults without children coming into the area. This would have supplemented the information given on the sign and provided them with more context and information about Old Science Week. It would also have meant that these visitors would still have gained something from the display when Dee and I were unable to speak with them, for example because we were busy talking to or working with the families. Overall I thoroughly enjoyed the time I spent at Lotherton, talking to the families and adult visitors, and I think our ‘Old Science Week’ activities provide a good model for running such events in future. However, I would bear in mind a few points where we could improve on the event. If possible it would help to have two people from the university; it might not always be possible for the house staff to be present, so in order to make the most of all of the visitors, and talk to as many people of different age groups as possible, it would help to have two people able to give personal interpretation present consistently over the course of the day. This would also help with taking photographs of the event, something which I found it challenging to fit in as I was busy speaking with people, and to have stopped and taken photographs would more often than not have interrupted the flow, spoiled the atmosphere, and lost the interest and attention of the children. It may seem an obvious point, but university attendees should have some sort of identifying badge to wear; I had nothing at the beginning and I felt the difference it made. As mentioned above, I think a page of written interpretation aimed at the adult visitors who passed through the Servants’ Hall over the course of the week would have been helpful. It would not have been long, but would have added some depth and context to the objects on display, and to the theme of the week more generally. A picture of the house drawn for us by one of the kids. Thanks! Please leave any comments below; if you came along one day last week, we’d like to hear what you thought of it, and if you’re thinking of doing something similar to this in another country house then please get in touch! Hello! Hello! Are you there? Hello! Gran? Are you there? Day 3 of Old Science Week at Lotherton Hall saw us making telephones out of plastic cups and string. This was a very good activity for both the older and the younger children to engage with, as they could first be as creative as they wished with their cups, and then, with a little help on the knots, they could make and experiment with a rudimentary scientific instrument. The children really got into this, and there was plenty of shouting, some loud whispering, and even a bit of singing as they worked out how best to use them by making sure the string was pulled tight. However, we soon found it was a good idea to put some sellotape over the hole to make sure the string didn’t keep popping out of the cups! The adults had fun too; here is one of the children talking to his grandmother on his newly decorated string telephone! A heater? A bug zapper? It’s a toaster! The old electrical objects were still on display, and I got some intriguing responses when asking the children to work out what the toaster was; a heater was a fairly obvious guess, but a bug zapper and a laminator were definitely evidence of some pretty good out-of-the-box thinking from the visitors. As one of the items was an ice cream maker, which was not electrical, I asked the children to think about which of the items was the odd one out and did not use electricity. Some were surprised to be told that not everyone had liked electric lights at first, because they were considered to be too bright, and also to learn that old telephones were not as easy to use as their modern equivalents. A colourful set of telephones. When talking to the children about the electrical objects, we also took the opportunity to engage with the adults, and talked about how Lotherton Hall was electrified relatively early, having previously only been lit by oil lamps and candles. The decision to electrify the house, taken by Colonel Gascoigne around the turn of the 20th century, was not an obvious one, and was complicated and expensive as Lotherton Hall needed to be able to generate its own independent electricity supply. Whilst it may have been more common at that time to have gas lighting installed, Colonel Gascoigne was keen on modern technologies, and also had central heating installed as well as owning a fleet of motor vehicles, so he chose electric lighting. Read about what we did on the first day here!